What’s your biggest strength? We all have skills, talents and strengths. The question is, are we using them to the best of our ability? To wrap up our month long series on letting go, it’s time to let go and share our strengths, talents, and abilities. You may think you don’t have any special skills or talents, but that’s not true. We all have unique gifts, strengths, talents, abilities-whatever you want to call it. We use them all the time, whether we know it or not. Think about what you’re comfortable doing, saying, or helping others with-these are your talents and gifts. When I was in middle school, I’d typically get home before my mom did from work. Often she’d ask me to prep dinner to make mealtime easier and less hectic. She gave me tips or I’d follow her recipes in the beginning. But soon, I learned to wing it, improvise and tweak what she told me. I figured out my favorite way to clean chicken before baking it. I added additional ingredients to her meatball recipe, then created my own. Before I knew it, my love for cooking was born. I never realized I liked to cook until she asked and taught me. Now, I love to read recipes and cookbooks, but I rarely follow one without some added embellishment on my part. It’s just how I cook. It’s similar to speaking in front of others. I was never comfortable with it until someone asked me and I tried. This holds true for many of our talents and abilities. We love and are good at them because we first tried, often at someone else’s request. Now it’s time to let go (even just a little) to what we’re good at to pass that knowledge and love onto someone else. What do we need help with? Whether it’s cooking, cleaning, a work or leisure project, often we could use help in some area. We know what we want and have a talent for creating it, but letting go and allowing others to help allows us to share our expertise while gaining needed assistance at the same time! What do we love? When we love something, learning something new about it isn’t work, it’s enjoyable. It stretches our brains and improves our abilities. Sharing knowledge about something we love with those who are interested is one of the best ways to let go while gaining something too. Not only will we help others learn something new, we strengthen our brains by experiencing it through them. It’s a win-win situation! What do we want to pass on? Whether it’s a family recipe, heirloom, life lesson, wisdom or meaningful memento, there are things that mean something to us in this life. Keeping them to ourselves never allows its meaning to be shared with others. If it’s important to us, then it may be important to share. Stop holding onto something that could be just as if not more meaningful to others. Let go, share the significance and pass it on. Do it now before life changes, because we are never guaranteed another moment. Letting go and sharing our expertise, our talents, strengths or even our life mementos is important, not only for us but for others in our lives we care about. 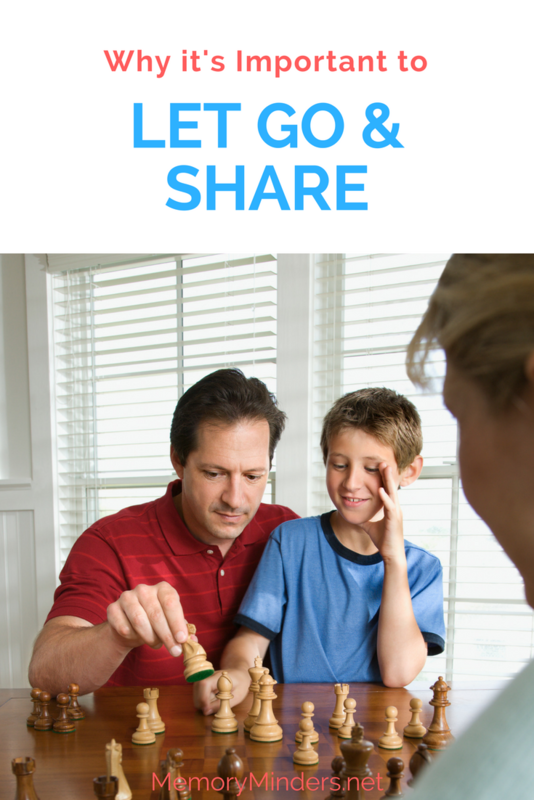 Let go and share to keep making all your moments memorable!